Take advantage of Marrakech at the finest with not only coming to Marrakech .. but staying at " The Coolest Riad " with taking advantage of Marrakech at the finest in a fantastic located riad in the heart of Marrakech's medina ( old town ) five mn walk from Jemaa el Fna ( big square ) and with a car access as a secure parking fifty meters from the riad. The riad Marrakech Dar Najat is a welcome retreat from the hustle and bustle of Marrakech. 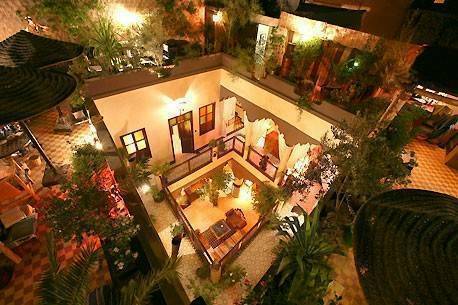 The guest house Marrakech is also very well located in the old center to get the real feel of traditional Morocco..! Very welcoming riad Marrakech, Dar Najat provided a true sanctuary away from the energetic vibes of Marrakech. The riad Marrakech is cool and quiet and all the staff is very friendly, it's a relaxing place with a great atmosphere! The riad Marrakech, Dar Najat is located in the center of the medina of Marrakech within five minutes walk from big square. The calm and the serenity of riad Marrakech, Dar Najat gives you a sense of peace and tranquility. After having discovered the multiple visual treasures of the medina of Marrakech through an abundance of colors, craftsmen of any horizon and architectural treasures in improbable lanes, you'll find all the heat of the team of riad Marrakech, Dar Najat. The guest house Marrakech with Souad, Hind, Kbira, Amine and Olivier will do their Best to make your stay in riad Marrakech a perfect success hospitality, user friendliness and intimacy are the reflection of this riad Marrakech completely rehabilitated with refinement and romantics. Around the terrace of riad Marrakech Dar Najat, you'll spend long moments surrounded by a floor of roses and attentions of every moments without forgetting an eastern gastronomy full of colors and dietetic benefic cooked by Souad and Hind, our very dynamic cooker! The panoramic sight of all the medina of Marrakech will fill with wonders by one to lay down sun, festival of colors and the living room "Africa" perched on the terrace will be certainly the Best place of in love guess..! Let's not forget an appreciated collection of music from all horizon.. The heating Jacuzzi on the roof of the riad Marrakech, Dar Najat, will erase the steps and other efforts of the day for the courageous ones! This riad Marrakech, Dar Najat, is a place of meetings, poetry and in addition with the statements of all, the team of the guest house Marrakech is rather funny..! The audio visual equipment of the riad Marrakech, Dar Najat, will be precious for travelers who need to be connected! The environment of the guest house Marrakech is an invitation for travel and pleasure for the eyes..
Riad Marrakech, Dar Najat, not to be missed for unforgettable holidays! classified by the authorities of Marrakech. The riad Marrakech Dar Najat is a precious little gem in the middle of the busy Medina of Marrakech; nicely decorated rooms with a lovely roof Garden where you can sit in the evening, relaxing and chatting with the other guests about your experiences of the day. If you are looking for the hospitality, great food, few house rules and the personal welcome of being in someones lovingly restored guest house Marrakech in the old Medina, then this is certainly the place! Anything that you need is never too much trouble for Oliver and the staff and after some long hours getting lost in the Souks, it is a very welcome oasis to return to riad Marrakech Dar Najat to listen to some great tunes on the roof terrace, drink some wine or mint tea, chat to the owners and other guests and generally chill out. The decor of the Riad Marrakech, Dar Najat is gorgeous, it having had the careful attention of the French owner who is an interior decorator. He and his Moroccan wife are very welcoming and one feels part of a family. There are beautiful plants that blend with the exquisite tiles of the old building and the beds and seating is very comfy with plenty of spaces to chill out, even a Jacuzzi on the top roof terrace. Breakfast is a sumptuous affair - much more than one usually gets in Africa, the price is fair for the comfort and ambiance and trips can be arranged in the guest house Marrakech, Dar Najat. 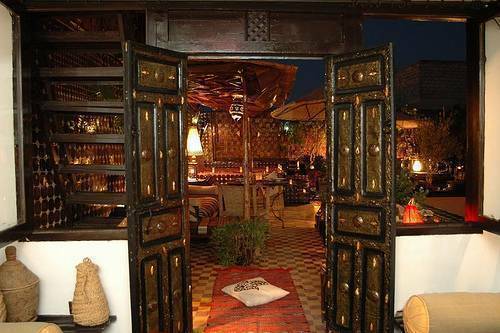 The riad Marrakech, Dar Najat offers another glance to you on Marrakech. Air-conditioning in all the rooms of riad Marrakech, Dar Najat. Jacuzzi King Size heating on the terrace of the guest house Marrakech, Dar Najat. Access car fifteen meters from the riad Marrakech, Dar Najat. Internet WIFI in all the riad Marrakech, Dar Najat. ACCOMODATION MARRAKECH, into Dar Najat "The coolest riad in Marrakech"
The gastronomy is also one of the strong points of the riad Marrakech with Souad and Hind, our very dynamic cooker which will prepare succulent dishes of which it has the secrecy, treasures of dietetic benefits faithful to the idea that in the East, the ways of the belly carry out in the middle.! The riad Marrakech, Dar Najat is at the same time a place favorable with the meeting and with the exchange and the riad Marrakech Dar Najat flatters itself to transform his friends customers into ambassadors of the guest house Marrakech of share the quality of the reception, the services, and this impression quite particular to riad Marrakech, Dar Najat to be transported far from the obsolete considerations of the town life and to be finally in harmony. Breakfast in riad Marrakech, Dar Najat is a wonderful selection of fresh fruit, fresh bread, croissants, pastries, pancakes and eggs, served with freshly-squeezed orange juice and fantastic coffee.
" Coolest Riad in marrakesh "
All rooms with air conditioning&wifi&ensuite shower&toilett with lovely decoration fusion of africa and design the deluxe and the superior can be in twin or double bed as required. If cancelled up to 30 days before date of arrival, 20 % of all nights will be charged. If cancelled up to 15 days before date of arrival, 50 % of all nights will be charged.